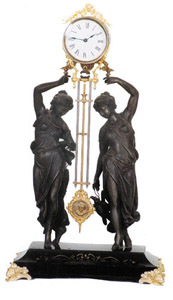 Ansonia Clock Co., "Double Figure Swing", or "Fisher and Huntress Double Swing", ca 1883. This base is the more rare and desirable deluxe base. Bronzed ornaments on the enameled iron base and on the swinging arm are bright, but the bronze finish on the statues is now a dark gray. You can have new gilt put on them if you like, but they look awfully nice like they are. Excellent can and movement, beveled glass, great dial, running. Ly-Seth Thomas, page 704.